We are a small, family-owned boutique winery specializing in Italian varietals made in the heart of Napa Valley, where the soil is supremely suited for growing these types of grapes. Benessere, an Italian word meaning “well-being” or “living the good life”, reflects our dedication to producing Italian varietals and our penchant for providing warm, welcoming hospitality. 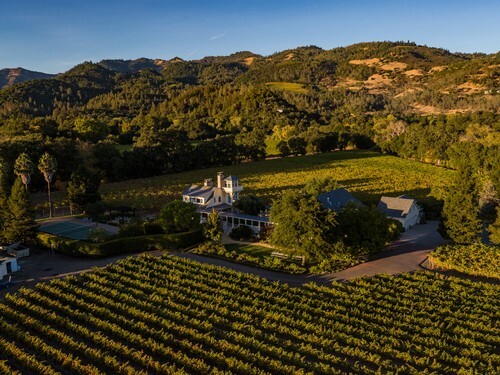 The property was purchased in 1994 by John and Ellen Benish and they immediately began restoring the winery, residence and replanting the vineyards. In 1995, they produced their first vintage of Sangiovese and the dream was realized. Since that inaugural vintage, they have added other sought after Italian varietals to their portfolio – Pinot Grigio, Moscato di Canelli, Sagrantino and Aglianico. Additionally, we also produce a “Super Tuscan” style blend called Phenomenon as well as two decidedly delicious Zinfandels – one from our ‘Black Glass Vineyard’ and one from the ‘Collins Holystone Vineyard’ adjacent to our estate. Steeped in history, this property was originally used as a cattle ranch, then dairy farm in the 1920s and 30s before being converted into a thoroughbred horse ranch in the 1960s – complete with a racetrack at the front of the property. By the mid-70s, the property changed owners and a majority of the property was converted to vineyards. You still see the stall doors from when the original barn was converted into a wine cellar. Prior to any formal ownership of the property, the local Native American tribe used obsidian found on the property to make arrowheads and tools. On occasion, we still manage to find fragments of obsidian, reminding us of days past, in our aptly named ‘Black Glass Vineyard’. The Benish family chose to name their winery ‘Benessere’ because it embodies everything they fell in love with on a trip to Italy in the late 1980s. “Living the good life” is what they hoped to bring to their little slice of Heaven here in Napa Valley and so ‘Benessere’ conveys those unique qualities of a wine country lifestyle one can only find here.